We notice that back pain, and in particular lower back pain, is one of the most common complaints that patients attending our clinic suffer from. At least four out of five adults are experiencing it at some point in their lives. The causes of low back pain vary from poor lifting or incorrect carrying of heavy weights, poor posture, stress, pregnancy and general wear and tear. The body is supported by the spine, which carries our spinal cord and nervous system. Nerves branch off the spinal cord between the vertebrae. Therefore, injury may not only lead to local inflammation and pain, but also to irritation of the spinal nerves causing pain elsewhere in the body. Commonly the pain will refer into the buttock and the back or front of the thigh and occasionally all the way to the foot and toes. A common myth is that acute low back pain is caused by what is commonly known as a “slipped disc”. Discs do not really slip, but they can bulge and sometimes this can cause leg pain. Why do back problems occur? Abnormal spine movement can cause irritation to the nerves. Stressful lifestyle, sports injuries, poor posture, overwork can all cause the spine to malfunction. A back muscle strain or ligament strain is one of the most common causes of acute lower back pain. Lifting a heavy object, twisting, or a sudden movement can cause muscles or ligaments stretch or develop microscopic tears. Overuse injuries are a very common source of lower back pain and stiffness. Others causes of chronic lower back pain can include disc tear, vertebral fractures caused by osteoporosis, spinal stenosis, scoliosis. Less commonly, lower back pain can be a sign of a serious medical condition, such as diabetes. 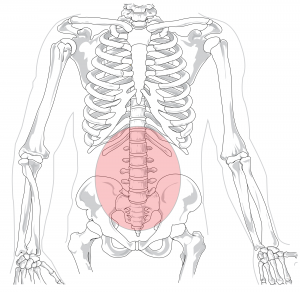 Acute and chronic low back pain responds well to chiropractic treatment. Official government guidelines from the NICE (National Institute for Health and Care Excellence, UK) suggest the early referral for manipulative treatment, such as chiropractic, is the most effective way of dealing with acute and chronic low back pain. A chiropractor first takes a medical history and performs a physical examination (First Visit). Lab tests or diagnostic imaging may be necessary to determine if treatment is appropriate for your back pain. The treatment plan may involve one or more manual adjustments in which the chiropractor manipulates the joints, using a controlled, sudden force to improve range and quality of motion. Many chiropractors also incorporate exercise/rehabilitation into the treatment plan. The goals of chiropractic care include the restoration of function and prevention of injury in addition to back pain relief. Spinal manipulation and manual manipulation. This type of manual manipulation refers to a high-velocity, short lever arm thrust that is applied to abnormal vertebra with the goal of improving functionality, reducing nerve irritability and restoring range of motion in the back. It is also commonly known as “chiropractic adjustment”. Mobilisation. Chiropractic mobilisation refers to low velocity manipulation, movement and stretching of the muscles and joints, with the goal of increasing the range of motion within those areas.